'GUY Special' - the Puppy-Bus. Who could fail to warm to this delightful design? This must rank as the fore-runner of the Mercedes mini-bus, that most potent agent of de-regulation. This is the only London Transport design that never ran in service in the streets of London. Go on, tell me I'm wrong! In the early 1950's there was an increasing need for a middle-sized vehicle which was at home in the more rural parts of London's Country. What was novel was that LT specified a vehicle on a standard chassis (the Guy Vixen) with a body by Eastern Coach Works, incorporating 'standard production units' and 'a balanced alligator bonnet'. The standard LT radiator filler cap was hidden beneath the hinged manufacturer's emblem. Thank goodness there was more in common with the RF than just the seats and interior lighting. Eighty-four of these delightful machines were built, and some of the first were delivered to Hitchin garage (HN) to replace the tiny, elderly Leyland Cubs on local route 383. Others reached Hitchin from Hertford on the deeply rural 386 and 329 routes. The last examples of the GS class (33 and 42) were withdrawn from public service on 30th March 1972. It also spelled the end of two more traditions, as the village of Loudwater never saw another service bus and the village was the very last outstation operated by LT (LCBS at the end). 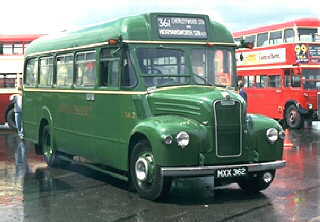 Until his retirement in 1971, driver Harry Cross had run the 336A service to Rickmansworth. The day's takings were paid in at Rickmansworth LT station, and once a week he would take his vehicle to Garston Garage for fuel and oil, and to collect his wage packet. The vehicle ran from the garage for the remaining few months. If I ever rode on a GS, I was too small to remember, although it is certain that they penetrated the growing Oakfield Estate in Hitchin as the 383 route was extended into a cross-town service. A ride on this vehicle at Classic Automotion 1997, where the picture was taken, proved a delight, with a wonderful growling note from the Perkins 6-cylinder engine.A staggering 30-odd of these buses are now in preservation - showing that size does count!